On Puerto Rico's undiscovered coast, 90 miles southwest of San Juan, there is a 20-acre tropical resort with a three-quarter mile long sandy crescent shaped beach which fronts the clear blue Caribbean Sea. 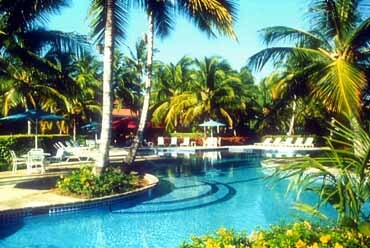 Situated between the two historical cities of Ponce and San German, surrounded by an 18,000 acre UNESCO reserve - the Copamarina Beach Resort features diving, water sports, fishing and a spa. accommodation is air conditioned and is only footsteps from the beach. Amenities include cable TV, mini refrigerators, telephone, in-room safes, coffee maker and hair dryer. There are two new 2,600 square foot three bedroom, two bath villas which sleep up to six that are include full kitchens, dining room, living room with entertainment center and wrap-around verandas. 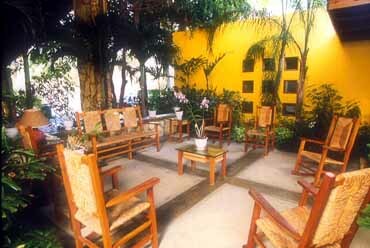 The Las Palmas Cafe serves breakfast and lunch overlooking the Caribbean. Nightly entertainment is featured and award winning chefs offer Puerto Rican Nouvelle Cuisine specialties, fresh seafood and a complete wine list. in lush tropical gardens and beach settings. The fitness center is open at 7:00 a.m. till 7:00 p.m. and free weights, Universal equipment, aerobic cycles, health wakers, running machine, stair climber and exercise mats are featured. 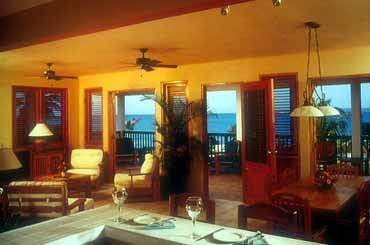 All this and a full view of the beach and Caribbean is yours to enjoy while working out. The on-site Bodyderm Spa specializes in massage and body treatments. Reiki, Rhaja Yoga and meditation workshops are also available upon request. You may choose from a deep tissue massage of 60 minutes, a relaxation massage designed to target muscle tension and stress, short time massage for a busy lifestyle, aromatherapy, steam capsule spa, anti-cellulite treatment, body mud wrap and manicure/pedicure services. trips, beach volleyball, 2 adult pools, 2 kiddy pools, children's playground and 2 Jacuzzis. A 5-minute water taxi ride takes you to "Gilligan's Island", an offshore coral reef cay, ideal for sunbathing, swimming and snorkeling. There are 2 tennis courts which are lighted for night play. 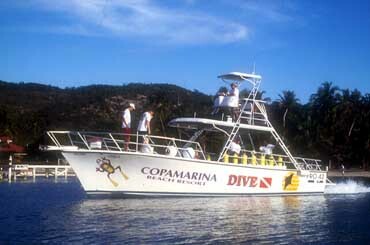 Copamarina offers an on-site dive service with impressive dive sites. The area is unspoiled and virtually undiscovered, providing an opportunity to explore waters once dominated by the Spanish Conquistadors. Puerto Rico has a rating as one of the top three dive destinations in the Caribbean. The resort's PADI instructors offer a variety of dive courses and diving expeditions perfect for both beginners and experts.